Use in hospitals, nursing homes, home health. For CNAs, LPNs and family care givers. Explains the causes and prevention of pressure ulcers. 100% Educational. No product promotions. No commercial bias. PowerPoint CD-ROM also available. $50. Useful for presenting information specific to your facility on products and procedures relating to pressure ulcers. This 19-minute training video is designed for nurses, nursing assistants and family care givers. Viewers lean common causes of pressure ulcers, the sites on the body where pressure ulcers may occur, who is at greater risk, how to perform the blanching test for persistent erythema, and why the force of shear contributes to pressure ulcers. The positive message viewers take away from this information-filled video program is that we can prevent many pressure ulcers before they ever get started. This is a unique program that captures the learning needs of nursing staff at all levels. A quality product, and a market leader. Maryam Mamou, BSN, RN, CRRN, CLCP, CWOCN. A&A Care Management Inc. Program overview Prevention is stressed throughout this program. Shows examples of pressure ulcers. 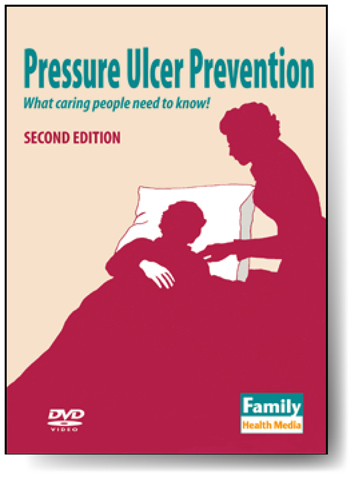 Teaches how pressure ulcers get started. Describes warning signs. Explains importance of turning. Graphically demonstrates major pressure points. Lists nine prevention tips. Suggested uses Hospitals, long-term care and home health settings. Nurse aides, nurses, family care givers. Discharge planning. In-house TV channel. Nursing students. Enterostomal therapy nurses. Physical therapists. Available for free preview? Yes, to qualified health care professionals.